A poppy for Remembrance Sunday 2016? | News | Brilliant Wall Art. Blog › Information › Will you be wearing a poppy on Remembrance Sunday? We will at Brilliant Wall Art. A writer first made the connection between the poppy and battlefield deaths during the Napoleonic wars of the early 19th century, commenting that fields that were barren before battle and burst forth with blood-red flowers after the fighting ended. Poppies have been associated with Remembrance Day in the UK and Veterans Day in the U.S. since its first observance, as Armistice Day, in 1919, in the wake of the human carnage of the First World War. Red poppies have become a prominent part of Remembrance Day in Canada, England, Australia and many of the Commonwealth nations around the world. The poppy’s significance to today’s observance is a result of Canadian military physician John McCrae’s poem…“In Flanders Fields”. The poppy emblem was chosen because of the poppies that bloomed across some of the worst battlefields of Flanders in World War I. It was natural that their red colour seemed an appropriate symbol to mimic the bloodshed of trench warfare. Two days before the Armistice was declared at 11am on November 11th, 1918, an American woman named Moina Michael was working in the YMCA Overseas War Secretaries’ headquarters during its annual conference in New York City. Inspired by McCrae’s poem, Moina purchased 25 silk poppies that she distributed to those attending the conference. The poppies were very popular at the meeting, which prompted her to begin an effort to have the poppy adopted as a national symbol of remembrance. She succeeded in having the National American Legion Conference adopt it two years later. The custom quickly spread to Europe and was especially embraced by the British Royal Legion and veteran’s groups throughout the British Commonwealth. A small number of people choose to wear white poppies to indicate a preference to look forward to peace rather than backward at the sacrifice. Those who wear the white poppy have, since their introduction in the 1920’s, expressed their desire for peaceful alternatives to military action. So please wear a Remembrance Day poppy, real or artificial in red, white or whatever colour you choose, today as part of your observance of Remembrance Day. You will be honouring those who sacrificed their lives to protect our way of life and democracy. 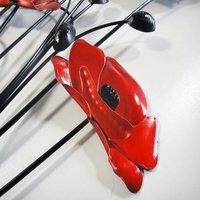 Please buy your poppies, but also remember the fallen by purchasing poppy art at Brilliant Wall Art. It will remind family and friends of these important pivotal moments in history. Remembrance Sunday will be celebrated on Sunday 13th November this year. Simply spend a few minutes browsing our web pages, we offer a myriad of products and ideas.